1Nutrient Management Spear Program, Department of Animal Science, Cornell University, 2PRODAIRY, Dept. of Animal Science, Cornell University, and 3Agricultural Consulting Service Inc.
Phosphorus enrichment of surface waters leading to algal blooms and other issues related to eutrophication continues to be an issue in a number of locations. Runoff from agricultural fields can contribute to P runoff and management tools and policies have been developed to manage runoff risk. In 1999, New York (NY) introduced its first Concentrated Animal Feeding Operation (CAFO) Permit. This was followed by release of the NY Phosphorus Index (NY-P Index; USEPA, 1999; Czymmek et al., 2003) and establishment of a statewide on-farm research partnership in 2001. State policy requires implementation of the Natural Resources Conservation Service (NRCS)-NY 590 nutrient management standard on all farms with a CAFO Permit as well as animal feeding operations (AFOs) receiving state or federal cost share funds for manure storage and other related practices. Since 2001, the NY-P Index has been a required element of the NY 590 nutrient management standard. In May of 2009 President Obama signed an Executive Order to intensify efforts to protect and restore the Chesapeake Bay and its watershed. This Order resulted from the belief that there had not been sufficient progress in restoring the health of the Bay and its watershed in the past 25 years. As a result of the Order, USEPA published Guidance for Federal Land Management in the Chesapeake Bay Watershed (“Guidance document”) on May 12, 2010. This document states that managing P through state-based P runoff indices is flawed and results in over-application of P to cropland. In the Guidance document, USEPA replaced the P index approach with a Psat approach based on a 20% Psat cutoff for manure or fertilizer application (USEPA, 2010) (Figure 1). While only applicable on federal lands at this point, it is viewed by some as a potential precursor to more widespread implementation on private lands. Figure 1. Guidance for Federal Land Management in the Chesapeake Bay Watershed: 1.2.2 Implementation Measures for Agriculture in the Chesapeake Bay Watershed to Control Nonpoint Source Nutrient and Sediment Pollution, USEPA. The implementation of the Psat cutoff for P application to federal land, and the potential for implementation of a similar cutoff for all agricultural land, motivated a project to compare the impact of use of a Psat approach on P fertilizer and manure application cutoffs as compared to our current NY P index approach. Specifically, our goal was to evaluate if a Mehlich-3 derived Psat (P/[Fe+Al]) could be converted to a particular Cornell Morgan P and if so, determine the potential 20% Psat cutoff for manure application. In total, 91 soil samples were tested for Cornell Morgan (Morgan, 1941) and Mehlich-3 (Mehlich, 1984) extractable P, Fe, Al, and Ca. The Psat was determined as P/[Fe+Al]*100 (molar ratios) according to Kleinman et al. (2002). As mentioned, there are different methods for estimating Psat. The ratio of Mehlich-3 extractable P over Fe+Al was selected as a most likely candidate for implementation, because it is a commonly available agronomic test, despite evidence that this method (1) is unsuitable for calcareous soils found in parts of NYS, and (2) requires soil specific calibrations. Samples were collected from New York farms identified in conjunction with Agricultural Consulting Services, Inc. (ACS). Samples were air-dried and ground to pass a 2 mm sieve prior to laboratory analysis. 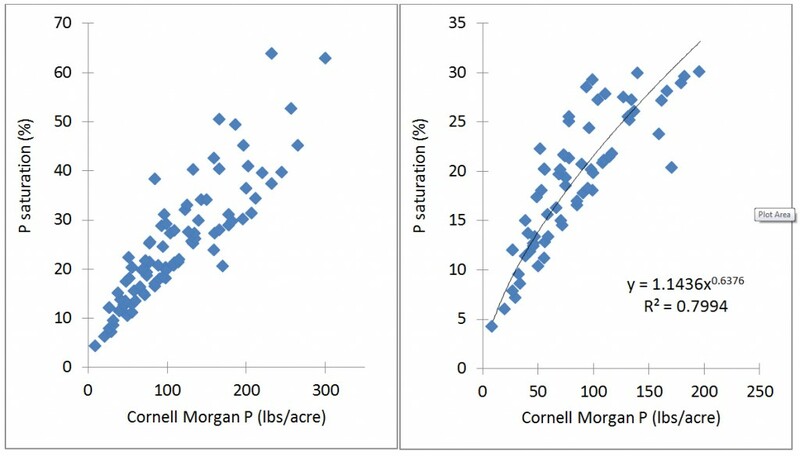 Regression analyses were performed to determine if Morgan data could be correlated to Psat and if so, at what Cornell Morgan soil test level a Mehlich-3 derived P saturation of 20% was obtained. Across all soil samples, a P saturation of 20% corresponded to a Cornell Morgan P of 86 lbs/acre (Figure 2). This Cornell Morgan value was somewhat higher than the 56 lbs P/acre (Cornell Morgan test) reported for 59 soil samples from the Delaware River Watershed in 1999 (Kleinman et al., 1999; assuming that Psat based on Mehlich-3 equals 0.7 times Psat derived from the oxalate extraction according to Kleinman and Sharpley, 2002), and similar to the 80 lbs P/acre (Maine Modified Morgan test) for 106 soil samples submitted to the Maine Soil Testing Service (Ohno et al., 2007). The New York data also show a wide range in soil test P equivalents; for example, of the 7 soils with a Psat of 20%, corresponding Cornell Morgan P levels ranged from 56 to 172 lbs P/acre with a median value of 71 lbs P/acre. Similarly, soils with a Cornell Morgan P of 75-85 lbs/acre corresponded to a Psat ranging anywhere from 16 to 38%. Figure 2: Relationship between the Cornell Morgan P test and P saturation derived from Mehlich-3 data (P/(Fe+Al) in molar ratio). 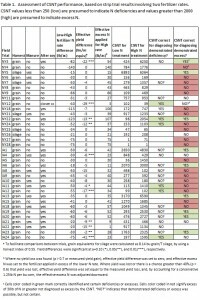 The implementation of a Psat cutoff of 20% for manure application instead of the NY-P Index will not impact manure application to high risk fields with a Cornell Morgan soil test of 80 lbs/acre or more, as the current P Index will not allow manure application to those fields as the NY-PI score will be 100 or more if the the transport factor is 1.0. Given that a very low percentage of NY fields test greater than 80 lbs P/acre (about 5%), implementation of a Psat in NY will have minimal effect on manure application practices. However, it could adversely impact farms with fields with very high soil test P but low transport risk. Such Psat based policy purports to address manure disposal (i.e. application beyond what would be most optimal for P resource management) but will increase the use of purchased fertilizer as it does not account for fertilizer value of N and K in the manure. Further, we do not believe implementing the Psat cutoff in NY offers real environmental benefit because as a chemical test alone, it fails to account for key, field specific risk considerations of landscape position and relationship of the field to surface waters. Implementation of a Psat approach will cause restrictions on P application for very high P fields with a low NY-PI transport risk. On average, across all soils in the study, a Psat of 20% corresponded to a Morgan soil test P level of 86 lbs/acre, just above the current cutoff for P application for fields with a high transport risk. This means that implementation of a Psat approach would eliminate manure and fertilizer application to fields with a Cornell Morgan P of 86 lbs/acre, independent of the risk of transport of this soil test P to surface or groundwater. We do not recommend the application of the Psat approach in NY as it will increase costs for some farms while unlikely to offering corresponding environmental benefit. Czymmek, K.J., Q.M. Ketterings, L.D. Geohring, and G.L. Albrecht. 2003. The New York Phosphorus Index User’s Guide and Documentation. CSS Extension Bulletin E03-13. 64 pp. Available: http://nmsp.cals.cornell.edu/publications/extension/PI_User_Manual.pdf [29 January 2012]. United States Department of Agriculture and Environmental Protection Agency (USDA-EPA). 1999. Unified National Strategy for Animal Feeding Operations. Washington DC. Available: http://www.epa.gov/npdes/pubs/finafost.pdf [23 April 2012]. United States Department of Agriculture and Environmental Protection Agency (USDA-EPA). 2010. Guidance for Federal Land Management in the Chesapeake Bay Watershed. Chapter 2. Agriculture. EPA841-R-10-002. Washington DC. Available: http://www.epa.gov/owow_keep/NPS/chesbay502/pdf/chesbay_chap02.pdf [23 April 2012]. Ohno, T., B. R. Hoskins, and M.S. Erich. 2007. Soil organic matter effects on plant available and water soluble phosphorus. Biology and fertility of soils 43: 683-690. Kleinman, P.J.A., R.B. Bryant, and W.S. Reid. 1999. Development of pedotransfer functions to quantify phosphorus saturation of agricultural soils. Journal of Environmental Quality 28: 2026-2030. Kleinman, P.J.A., and A.N. Sharpley. 2002. Estimating soil phosphorus sorption saturation from Mehlich-3 data. Communications in Soil Science and Plant Analysis 33: 1825-1839. This work was supported by the Cornell University Agricultural Experiment Station (CUAES) and in-kind contributions by Agricultural Consulting Service Inc. For questions about these results contact Quirine M. Ketterings at 607-255-3061 or qmk2@cornell.edu, and/or visit the Cornell Nutrient Management Spear Program website at: http://nmsp.cals.cornell.edu/. Comments Off on New York P Index Survey: What Caused Impressive Improvements in the NYS P Balance? The New York Phosphorus Index (NY-PI) was introduced in 2001. Since then, phosphorus (P) fertilizer sales (farm use) declined from 36,506 tons of P2O5 in 2001 (19.5 lbs P2O5/acre) to 18,610 tons P2O5 in 2009 (10.2 lbs P2O5/acre). In 2011, we surveyed Certified Nutrient Management Plan (CMNP) developers certified through the New York State Agricultural Environmental Management (AEM) program to evaluate their perceptions of the drivers for this change in P use. All 24 planners responded to the survey allowing us to document: (1) farms and acres covered by CNMPs and changes in management practices and soil test levels; and (2) planner perceptions of the drivers of these changes since the introduction of the NY-PI in 2001. The survey contained questions related to (1) farms and acres for which CNMPs were developed in 2010; (2) time and effort needed to do a NY-PI assessment for a field; (3) impact of NY-PI field assessment on changes in manure and/or fertilizer practices; and (4) changes in soil test P levels after 2001 when the NY-PI was introduced. In addition, planners were asked what they would tell policy makers about why farmers made changes and what policies and programs are needed to continue progress. The 24 CNMP planners consisted of 18 from the private sector, 5 from Soil and Water Conservation Districts (SWCD) and one from Cornell Cooperative Extension based in the New York City Watershed. One of the SWCD planners works with a private sector planner and their joint response is included in the private sector planner category. Table 1: Percent of all acres and farms under nutrient management planning in 2010 in New York planned by Soil and Water Conservation Districts (5 planners), Cornell Cooperative Extension (1 planner, New York City Watershed), and private sector planners (18 planners). The private sector planners were responsible for CNMPs covering 88% of all CNMP cropland and 76% of all farms with a CNMP (Table 1). Although private sector planners also planned most of the new plans in 2010 (74% of all acres, 62% of all farms), 22% of all acres newly planned in 2010 were farms in the NYC Watershed. The SWCDs planned less than 10% of all farmland and farms. The private sector and the SWCD planners worked primarily with CAFO-farms (200 cows or more) with average farm size exceeding 800 acres/farm. The planner from the NYC Watershed worked primarily with smaller operations (<200 acres/farm and 50-80 cows per farm) (Table 2). 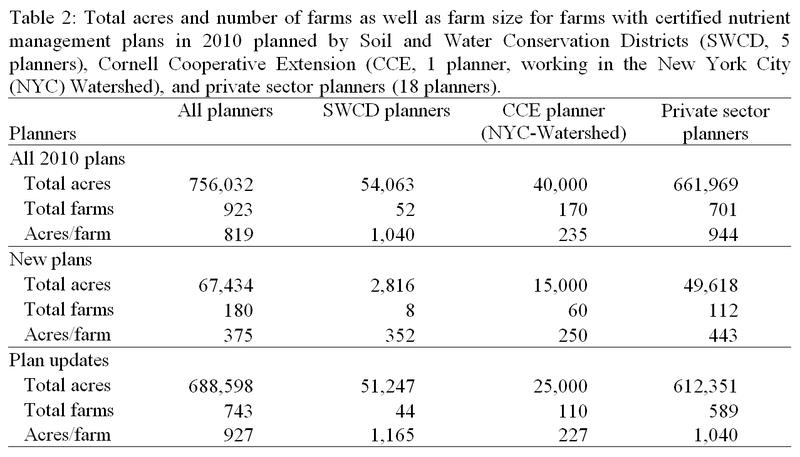 Table 2: Total acres and number of farms as well as farm size for farms with certified nutrient management plans in 2010 planned by Soil and Water Conservation Districts (SWCD, 5 planners), Cornell Cooperative Extension (CCE, 1 planner, working in the New York City (NYC) Watershed), and private sector planners (18 planners). About 1/3rdof all the farms that CNMPs were developed for in 2010 did not meet the minimum size requirements to be qualified as a medium or large CAFO but were in state or federal programs that required a CNMP. Most of the farms in the NYC Watershed are included in this category. 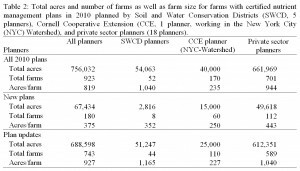 For both private sector planners and SWCD planners, new plans developed in 2010 tended to be for smaller farms (Table 2), consistent with the 100% compliance for CAFO farms in NY and expansion of CNMP planning to smaller farms involved in federal or state programs. The time needed to complete an NY-PI assessment for a field varied from 10 to 90 min, mostly dependent on whether the assessment was for a new field (and included determination of dominant slope and flow distance to streams), or if the assessment was an update from a previous year. Averaged across all planner responses, 40 min per field was needed, although 50% of all planners indicated assessments could be done within 30 min. About 40% estimated they needed 30-60 min per field, while 10% said more than 1 hour per field was needed. These differences might reflect differences in field topography (complex slopes, multiple flow paths etc.). The planners estimated that management of 17% of acres under nutrient management planning was altered because of an initially very high or high NY-PI score. As a result of NY-PI implementation, manure was reallocated to fields that would otherwise not have received manure (as indicated by 77% of the planners). The most frequent changes made in manure management were changes in timing and rate (86% of the planners ranked timing and rate as the top two changes made). Changes in method of application were less common (ranked in the top two by 13% of the planners only). According to 65% of the planners, the introduction of the NY-PI resulted in an increase in both acres per farm and amount of exported manure. Forty three percent of the planners indicated that NY-PI based planning decreased the average soil test P levels over time and 48% said the percentage of fields classified as very high in soil test P decreased. The introduction of the NY-PI did not change cow numbers per farm or poultry litter use over time, according to 57% and 78% the planners, respectively. Only 5% of the fields represented in the assessment tested above 80 lbs/acre Morgan extractable P, the level at which the NY-PI exceeds 100 if the transport risk from the field is high, and slightly less than ten times the agronomic critical level for most crops. Of the total cropland area, 4% could not receive manure under NY regulations because the NY-PI already exceeded 100 without the manure application. 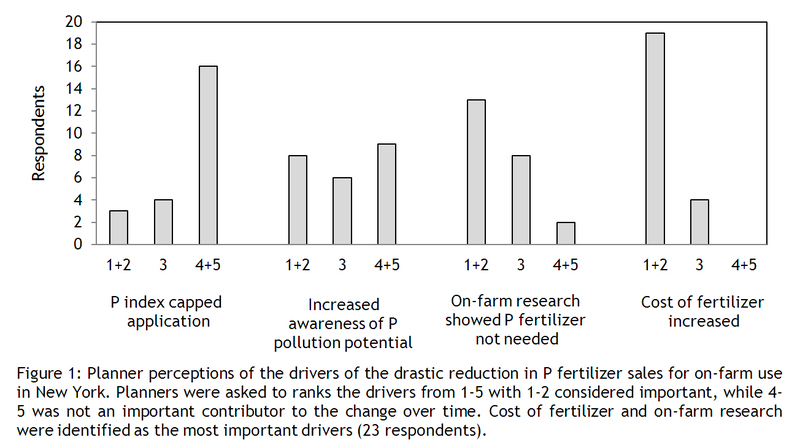 Figure 1: Planner perceptions of the drivers of the drastic reduction in P fertilizer sales for on-farm use in New York. Planners were asked to ranks the drivers from 1-5 with 1-2 considered important, while 4-5 was not an important contributor to the change over time. 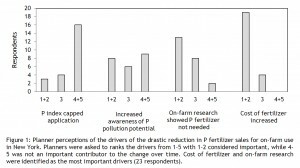 Cost of fertilizer and on-farm research were identified as the most important drivers (23 respondents). The two most important drivers for the changes in fertilizer use observed by NY planners were the price of fertilizer and the on-farm research partnership that showed that no additional starter P was needed if the soil test was classified as high or very high in P (Figure 1). The key ingredients for success identified by the CNMP planners were: (1) statewide awareness of environmental issues driven by both regulations and extension programming/training; (2) development and implementation of science-based and practical tools (like the NY-PI) that allow for farm-specific solutions to the challenges; (3) demonstrated need for or benefits of alternative management practices (i.e. an on-farm research partnership that addresses relevant questions and on-farm research that results in credible answers); (4) accountability; (5) state enforcement of regulations; and (6) the presence of economically feasible solutions. The success story of NY reflects a recognition of the need for change by both farmers and farm advisors, an interest in exploring management alternatives while looking for win-win approaches (i.g. reduced fertilizer use, re-evaluation of dairy rations, etc. ), and a willingness by farmers and farm advisors to contribute to on-farm research that generated reliable data and believable results (with as the foundation a trust-based farmer-advisor-researcher relationship). We conclude that the NY-PI contributed to the successful reduction in P use in NY by being acceptable to farmers and farm advisors as a risk assessment tool, by being directionally correct (it made sense) and by allowing farms to design farm-specific solutions. The story of NY shows that change can be obtained via policy, incentives, measuring and monitoring. For questions about these results contact Quirine Ketterings at 607-255-3061 or qmk2@cornell.edu, and/or visit the Cornell NMSP website at: http://nmsp.cals.cornell.edu/. For over fifteen years, the corn stalk nitrate test (CSNT; Binford et al., 1992; Blackmer & Mallarino, 1996) has been promoted as a tool to determine whether a corn crop received deficient, adequate, or excessive nitrogen (N) amounts during a growing season. In recent years, the test has been strongly promoted as part of the adaptive N management approach, and its adoption has increased geographically beyond Iowa where it was initially developed. Little attention has been given to whether the test is sufficiently precise for field-level N management. Excessive (>2000 ppm nitrate-N): high probability that N uptake exceeded plant requirement and that N was applied at excessive rates. The CSNT is promoted as a tool that provides a post–mortem evaluation, but concerns have emerged about its utility to growers. All reported data on the CSNT in journal articles and fact sheets show that yield adequacy is often observed with CSNT values in the “low” range, which raises doubts about whether the test is a powerful indicator of N deficiency. Indeed, a recent Iowa report based on a large data set of N rate trials (Sawyer, 2010) indicated that 15% of CSNT values in the “low” range were false positives, while of cases with field-verified N deficits, 30% of CSNT results were false negatives. A recent Maryland study involving 10 experiments (Forrestal et al., 2012) found about a third of “low” CSNT values to be false positives for deficiencies. Arguably, the primary value of the CSNT is related to determining excessive N rates, because N deficiencies can also be determined from leaf yellowing during the growing season. 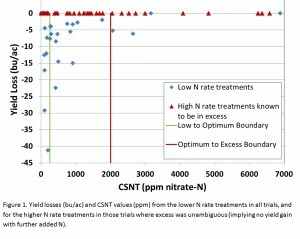 Recent New York research reports suggest that fields with high excessive N applications may still show low or optimum CSNT values (What’s Cropping Up?, Vol.21 No.3) and that site differences affect CSNT values more than excess or deficient fertilizer rates (Katsvairo et al., 2003). The above-mentioned Iowa report (Sawyer, 2010) indicated that 33% of cases with field-verified excess N applications were not identified through the test, i.e., one third were false negatives for excess N. Moreover, the Maryland study (Forrestal et al., 2012) found as much as half the CSNT results to be false negatives for excess N. These results challenge the notion that the CSNT is an effective tool for adaptive nitrogen management in corn production. As part of an Adapt-N beta testing effort (http://adapt-n.cals.cornell.edu/), we conducted 35 replicated strip trials on commercial and research farms throughout New York (17 trials) and Iowa (18 trials) in 2011. They involved two rates of N (a conventional “Grower” rate and an “Adapt-N” rate), which resulted in field-scale strips with N rate differences ranging from 15 to 140 lbs/ac. Trials had 3 to 8 replications for each treatment (except for 2 of the trials, NY8 and NY9, with only single strip yield measures, but replicated CSNT values). 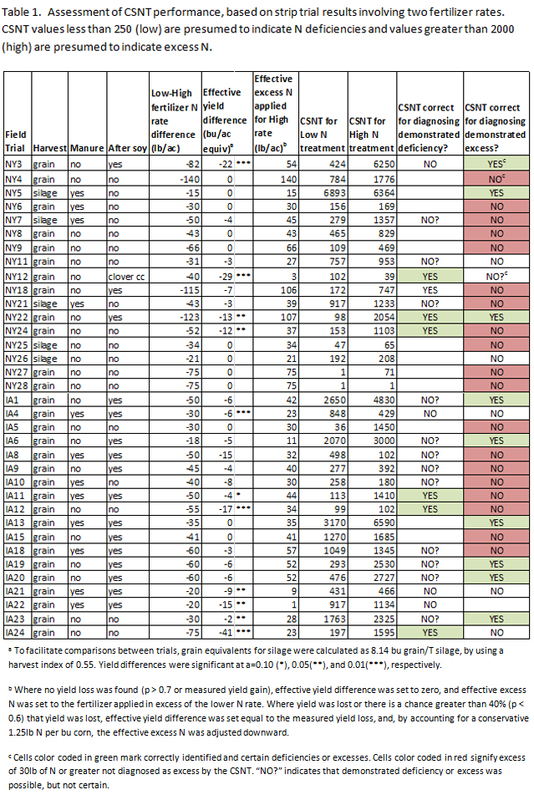 Trials were distributed across both states under a wide range of weather conditions, and involved grain and silage corn, with and without manure application, and rotations of corn after corn, corn after soybean, and corn after a clover cover crop (Table 1). New York yield results were reported in a recent What’s Cropping Up? article (Vol.22 No.2). Table 1. Assessment of CSNT performance, based on strip trial results involving two fertilizer rates. CSNT values less than 250 (low) are presumed to indicate N deficiencies and values greater than 2000 (high) are presumed to indicate excess N.
To allow for comparison across all trials, silage yield values were converted to grain equivalents (8.14 bu grain per ton silage, calculated by using a harvest index of 0.55). The yield results from a majority of the trials showed unambiguous over-fertilization associated with the higher N rate (same yields for both rates). In these cases, the amount of “effective excess N applied” was set to the N rate difference between treatments (Table 1). In some cases the low rate provided insufficient N (reduced yields), and the optimum N level appeared to be between the high and low rates. In these cases, the amount of excess N applied was estimated by subtracting a conservative 1.25 lb N from the N rate difference between the treatments per bushel of yield lost due to the lower rate. Fifteen corn stalk sections, sampled from each replicate strip, were dried, ground, and analyzed for nitrate content, according to published protocols. Means for each treatment are presented in Table 1. 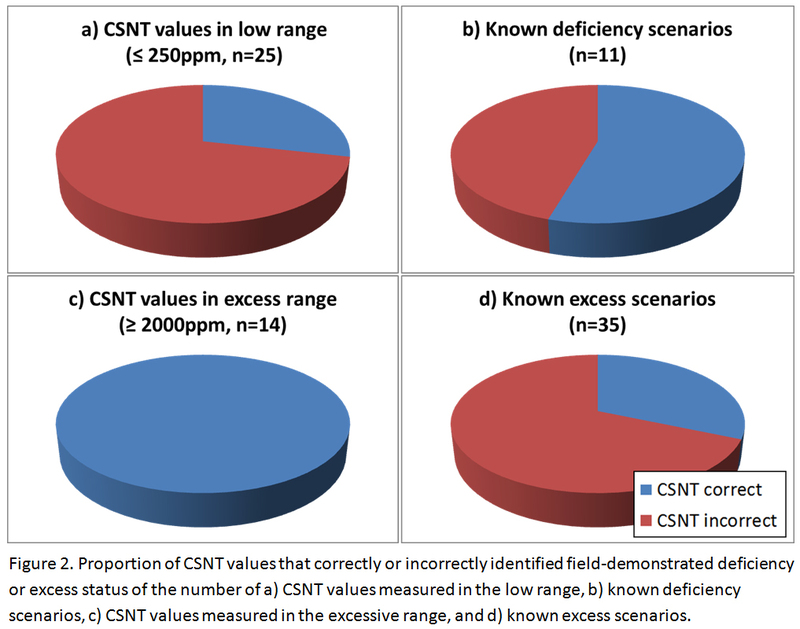 The utility of the CSNT was then assessed by evaluating the relationship between N rates, test values, and yield losses, and determining whether it accurately diagnosed field-demonstrated deficient or excessive N levels. While yield losses are strongly associated with low CSNT values, the reverse does not hold: Low stalk nitrate levels do not necessarily imply yield losses. Adequate N rates (no yield losses) can result in a wide range of CSNT values. i.e. the power of the test to detect adequate or excess N rates is limited because low CSNT values may be observed when yield losses did not occur. Conversely, high CSNT values correctly imply a high probability of excess N rates. Figure 1. 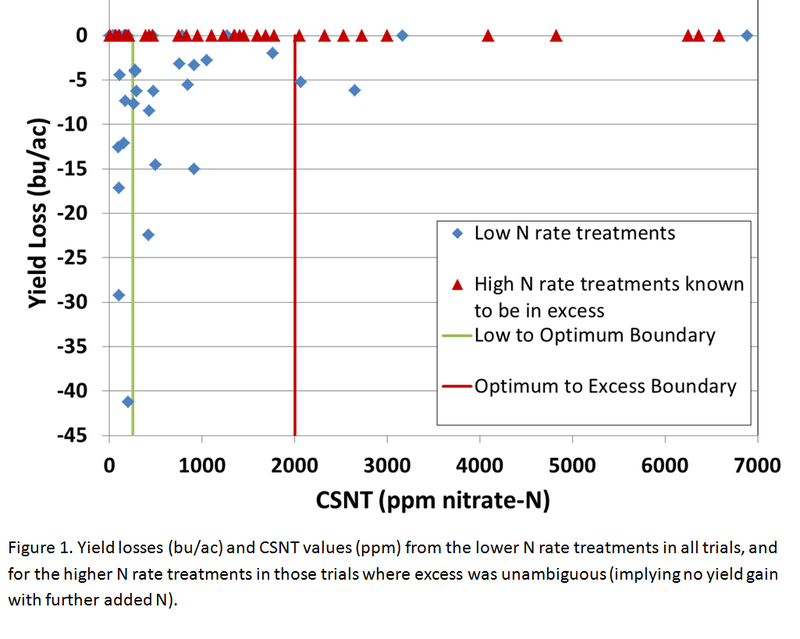 Yield losses (bu/ac) and CSNT values (ppm) from the lower N rate treatments in all trials, and for the higher N rate treatments in those trials where excess was unambiguous (implying no yield gain with further added N). In most trials, but not all, CSNT values for the upper N rates were higher than for the lower ones, indicating that the test shows some sensitivity to N levels (Table 1). However, in only 8 out of 35 trials (6 of them from Iowa) did the CSNT for the upper rate fall into a higher category than the CSNT for the lower rate. N Deficient Cases: An evaluation of the power of the CSNT to detect N deficiencies is presented in Table 1 and Figure 2. Of all CSNT values in the “low” range (25 instances), 60% were measured when N rates were in fact known to be adequate or even excessive (i.e., more than half were false positives of deficiency; Fig 2a). For only six of these trials, yield reductions were statistically significant and the CSNT correctly supported the results (highlighted in green in Table 1). Of the 11 trials where significant yield losses were measured with the lower N rate (and deficiencies occurred), the CSNT identified six (54%) correctly in the “low” range (Fig 2b), while CSNT results for the remaining 46% of trials were false negatives for deficiency. Figure 2. 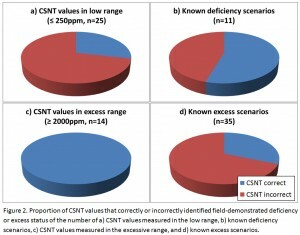 Proportion of CSNT values that correctly or incorrectly identified field-demonstrated deficiency or excess status of the number of a) CSNT values measured in the low range, b) known deficiency scenarios, c) CSNT values measured in the excessive range, and d) known excess scenarios. N Excess Cases: Instances with excessive CSNT values (>2000 ppm) were in fact known to have excess N or there was no evidence to the contrary (Table 1, Fig 2c). Therefore, the test was 100% accurate when showing excessive CSNT values, similar to Sawyer’s (2010) results. However, the opposite was not the case. We found that in only 11 of 35 cases (31%, 24% of those in NY) where unambiguous surplus N applications occurred, the CSNT correctly identified excess N levels (CSNT>2000 ppm, Fig. 2d). Conversely, for 24 of these 35 cases (69% overall; 76% for those in NY) the CSNT erroneously diagnosed non-excessive levels (i.e. more than two-thirds were false negatives). Many of these could be considered serious misdiagnoses (highlighted in red in Table 1, excess of 30 lb N or more). This includes Trial NY4 where at least 140 lbs N/ac excess were applied, Trial NY18 with an excess of at least 106 lb N/ac, and Trial NY27 and NY28 where at least 75 lbs N/ac excess were applied. In the latter case, the CSNT values suggested deficiency when in fact N was applied in considerable excess. We used 35 strip trials to make an assessment of the utility of the CSNT for corn nitrogen management on a field-by-field basis. We conclude from this year’s data and other published work that the test has limited ability to support management decisions. The primary question is whether the test can effectively detect excessive N applications. The answer appears to be “no.” Over two-thirds of the cases with substantially over-fertilized crops (up to 140 lbs/ac) did not show CSNT values in the excessive range (>2000 ppm), i.e. a majority of those cases were false negatives. Since the test’s primary need is related to determining excessive N rates, it appears to perform weakly in serving its main purpose. A second issue is whether the CSNT precisely determines N deficiencies. In this case the problem is with high rates of false positives, i.e., low CSNT values while N rates were in fact adequate or even excessive. An additional concern is that end-of-season evaluations of the current growing season have limited value for the predictability of N needs in future growing seasons. Research has demonstrated (summarized by van Es et al., 2007) that weather conditions during the early growing season greatly affect N losses and are a critical factor in determining optimum N rates. This implies that an interpretation of CSNT values requires an evaluation of the complex growing conditions of the past season, and that test results from one growing season have limited value for predicting N needs for the next year when the weather may be very different. Overall, we conclude from previous research reports and our own 35 strip trials that the CSNT is not an effective tool for use in field-specific adaptive N management, especially in the Northeast. We suggest that users of the test recognize its inherent weaknesses, and we recommend caution with the adoption of the CSNT for field-level adaptive N management. This work was supported by grants from the New York Farm Viability Institute and the USDA-NRCS Conservation Innovation Grants Program. We are grateful for the cooperation in field activities from Bob Schindelbeck, Keith Severson, Kevin Ganoe, Sandra Menasha, and Anita Deming of Cornell Cooperative Extension, from Dave DeGolyer, Dave Shearing and other staff at the Western NY Crop Management Association, from Eric Bever and Mike Contessa at Champlain Valley Agronomics, and from Shannon Gomes, Hal Tucker, Michael McNeil and Frank Moore of MGT Envirotec in Iowa. We also are thankful for the cooperation of the many farmers who implemented these trials. Binford, G.D., A.M. Blackmer, and B.G. Meese. 1992. Optimal concentrations of nitrate in cornstalks at maturity. Agron. J. 84:881–887. Blackmer, A.M. and A.P. Mallarino. 1996. Cornstalk Testing to Evaluate Nitrogen Management (PM-1584). Iowa State Univ. Extension. Available on the Web at: http://www.extension.iastate.edu/Publications/PM1584.pdf. [URL verified 2/14/12]. Sawyer, John. 2010. Corn Stalk Nitrate Interpretation. Integrated Crop Management News. Iowa State University Extension and Outreach. http://www.extension.iastate.edu/CropNews/2010/0914sawyer.htm [URL verified 3/11/12]. van Es, H.M., B.D. Kay, J.J. Melkonian, and J.M. Sogbedji. 2007. Nitrogen Management Under Maize in Humid Regions: Case for a Dynamic Approach. In: T. Bruulsema (ed.) Managing Crop Nutrition for Weather. Intern. Plant Nutrition Institute Publ. pp. 6-13. http://adapt-n.cals.cornell.edu/pubs/pdfs/vanEs_2007_Managing N for Weather_Ch2.pdf . [URL verified 2/22/12].